My New Favorite Body Wash! I haven’t been feeling very inspired in the cooking department lately, so today I thought I would share with you a new favorite product of mine. I was in my local Wal-Mart trying to pick out a new body wash to use. I had gotten a little bored with the Nivea one I was using, and needed a change. Spotting this Dial NutriSkin body wash, I picked it up and checked to see what it smelled like. Now, I don’t normally like fruity scented products because after awhile they start to seem a little too sickeningly sweet to me. This had a nice, light fresh scent, and only cost around $3.50. It also didn’t hurt that it was an Allure magazine Best of Beauty Award Winner for 2010 either. That little stamp on a product tends to grab my attention. I am such a sucker for good marketing! I am so glad I did give this a try. After having gone through almost an entire bottle, I still really like the fresh scent of this body wash, and it leaves my skin feeling moisturized- not dry at all. You see those tiny gold beads in the bottle? Those are micro-beads filled with hydrating fruit oil. One of my fears was that those little beads would be left all over my shower. That happened with a Dove body wash that I used years ago. Little blue beads all over my shower – not good. These little beads burst as you lather it up in your wash cloth, and as you bathe. No little beads left in the shower. My first bottle is almost empty, and I just purchased a second one last night at my grocery store. It was on sale at my Kroger for $3.23 – not a bad deal at all! 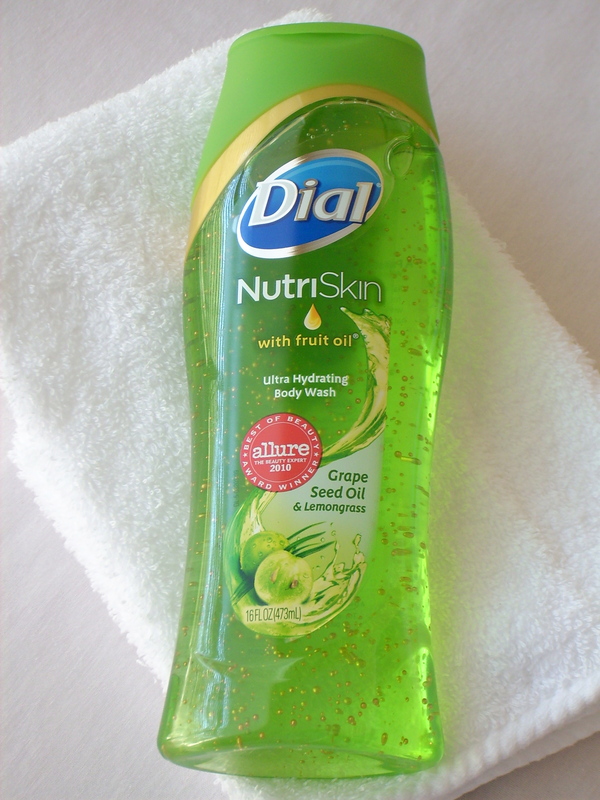 I just checked out the Dial website, and apparently there are two other scents of the Dial NutriSkin with fruit oil body wash. I haven’t found those at the store yet, but I will be keeping my I eye out for them! What is your favorite body wash? Do you like to switch it up occasionally like me, or do you stick with your old stand-by? By Tempie at November 6, 2018 .